This is the perfect time of the autumn season to switch gears from outdoor vegetable gardening to indoor countertop vegetable gardening. 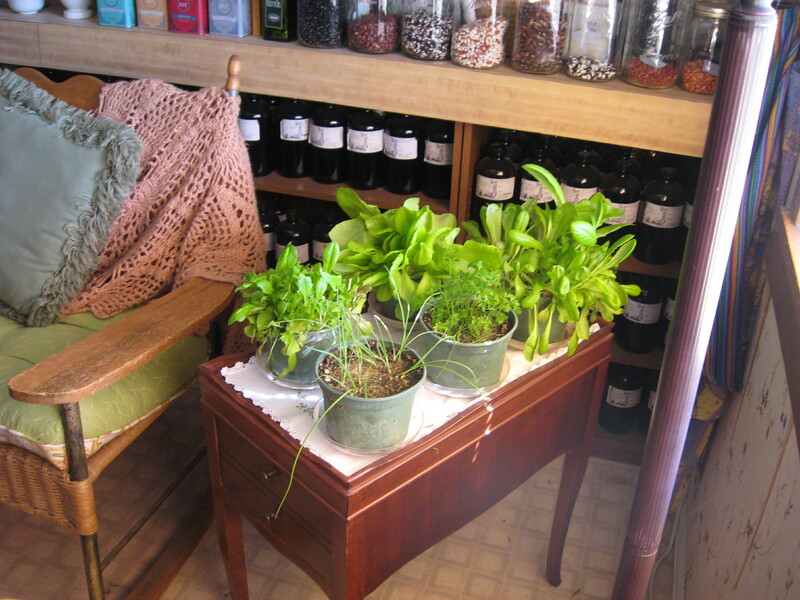 I grow salad greens of all types, green onions and Nantes carrots in my kitchen sitting area. This little end table works great as a growing spot, because it sits about 2 feet away from a bright window. With the short day lengths the sun is lower in the sky and so these greens get a great dose of bright but indirect light all day. For about 2 hours in the afternoon they have pretty much direct light, but not the rest of the day. I am growing these greens in 6″ pots, which I find is a good size for two people. You can see that the lettuce pot in the front has been cut and has started to re-grow. I can cut each pot of lettuces every week to 2 weeks. My onions and carrots are still really young and won’t be ready to harvest for a while. With the green onions I have a choice to just cut the tops regularly, allowing them to regrow and cut again, or I could sow new onion and carrot pots in succession so that when I harvest one pot by pulling them up I will have another pot growing for a later harvest. I like to have arugula, spinach, mixed salad lettuces, romaine lettuce, green onions and carrots growing this way throughout the fall, winter and early spring when it is too cold to grow veggies outdoors in Colorado. I also grow red robin tomatoes and purple beauty bell peppers indoors too, but more about that later.